First published in 1909, the great American version of Flaubert's Trois Contes recounts the lives of three plain and humble women, two working as household servants and the third, a Black woman, involved in an unhappy love affair. 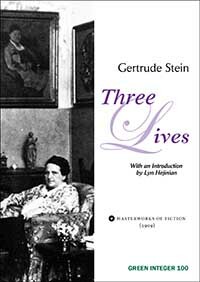 But to express these revelatory fictions in this manner is to miss everything, for Stein's language of the first decade of the 20th century is still as fresh today as if her characters had just created the American tongue. Poet Lyn Hejinian adds new perceptions about this work in her stunning introduction.